Pop music elitists and pessimists often bemoan that “everything has already been done” with a certain futile resignation. As a maker of music myself I’ve found through process that honest and deliberate imitation often yields new and fresh results. I drafted this essay in pen about a month ago on a long bus ride in South America. In the wake of Lady Gaga’s blatant copycat song “Born This Way” and just after the Grammy Awards (which I barely watched) I think it’s more prescient than it was when I first wrote it. Pop music elitists and pessimists often bemoan that “everything has already been done” with a certain futile resignation. The most astute of these often go on to make derivative music in the spirit of their well-cultivated tastes. MGMT, Lady Gaga and Arcade Fire come to mind but you could take nearly any popular music of the day as a case study and begin to isolate influences. In fact, you could say that about music from any time. I used to think in a narrow-minded way that imitation was indicative of a lack of imagination. As a maker of music myself I’ve found through process that honest and deliberate imitation often yields new and fresh results. I found the building nature of the melody moving and appealing. I began to half self-consciously graft DaVe’s lyrics over that melody. Very quickly the nature of the lyrics revealed new melodic directions and the finished song probably doesn’t resemble “Mother of Pearl” to most. I think “Weird World” is important to my work because it points the way to how I’ll make music in the future. I would like to suggest to the “everything new is old” camp (a song lyric from “Rock And Roll“, my old band Music For Girls, written by Wendy Chin and myself) that the reason why music progress seems slow, stale, bland and unoriginal is because of the stigma an artist gets internal and externally for being derivative. No one would dispute that an artist needs to make music they are moved by. Music composed solely of ground breaking sounds and concepts just will not stick. It will be too oblique and will require special effort from the listener beyond what is reasonable. “Pushing the envelope” in music is a special dialectic which is a dance between coupling the familiar in a Trojan horse with the groundbreaking to subtly take the listener out of bounds. If we look at the history of rock all the greatest started as unselfconscious imitators. The Beatles, Rolling Stones, Led Zeppelin etc. This uninhibited impulse to steal directly pointed the way for them to create the greatest works of the 20th century. The irony is that we, the artists of the present, are actually discouraged from borrowing directly from these greats in the way that they did to build their careers. Kirby Ferguson makes this point incredibly well in his documentary series “Remix“. Here’s Part 1 of the series (be sure to view Part 2 here). In an interesting and ironic twist, the music technology of today beckons the artist to sample, remake remodel (note the homage to The Beatles in the middle of that Roxy Music song). The conclusion I’ve come to for my own creativity is to simply forget all about the dinosaur music industry and just MAKE. Don’t censor. Forget selling. We’re at the edge of an avalanche of fresh music that is liberated from the requirements of industry. Groups like Girl Talk are a primitive indication of what’s to be unleashed by uninhibited musicians. Artronica, a movement in which I’m a ‘founder’, represents this liberated music. Our intellectual device is to classify the music we make as fine art. It is not a necessary classification for all liberated music, just the niche we choose to occupy because of the purpose it lends to the music we create. I’m advocating a music process that freely borrows from the past without concern for the pretense of originality. This is the way out of the pop music doldrums taking us to a new era of fresh and original music. It would be more Gaga-honest if she simply sampled “express yourself ” to create something new altogether rather than present this single as if it was born this way -new and original, for apparently it wasn’t. Despite the artist’s best and let’s hope earnest intentions. That about sums up my own position on the controversy. 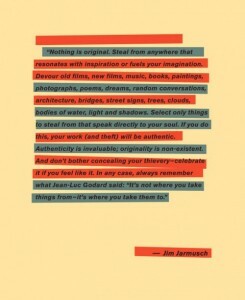 If you’re going to steal, STEAL. Go all the way with it, don’t tip toe around it. Dive in. Only with that clarity and boldness (and audacity) is when you may just make something new. Let us close now with The Staple Singers hit from 1972, Respect Yourself (brought to my attention by my friend Steven Roberts).